was appointed Rector in 1727. He was the son of Thomas Rogers, born at Dowdeshall, Gloucestershire, and was educated at Queen's College, Oxford; he matriculated 16th March, 1705-6, aged 16; B.A., 1709; M.A., 1712. On his appointment to the Parish of Lisburn he produced letters of orders showing that he was ordained priest 11th September, 1713, in the Cathedral Church of Oxford by William Talbot, who was Bishop o£ Oxford 1699-1715 ; before coming to Ireland he was Rector of Whittington, Gloucestershire; 1718; he was Rector of Glenavy, Diocese of Connor; 1724-1727, and was Chancellor of Down and Rector of Portaferry, the Corps of the Chancellorship 1729-1741. He was appointed Rector 27th July, 1727; inducted 28th July by John Gayer, Vicar of Derriaghy, and read assent on 6th August same year. The first Vestry Meeting over which he presided is dated 22nd April; 1728, the last is dated 13th September, 1740. He was married in Lisburn Cathedral on 13th November, 1733, to Anne Redmond. Their son, William, was baptized 31st March, 1739; another son, Conway, was buried 26th November, 1737, and a daughter, Henrietta, was buried 26th March, 1736. His burial is registered 17th January, 1741. Mr. William Seed Church wardens. Strange to say, there is no mention of the building of the Vestry in the minute book. So it was probably built by private donations, and not by a sum appointed upon the parishioners. It would appear from a memorandum attached to the Vestry meeting of 1733 that Lady Midleton resided for a time in the Parish. She was a well-known churchwoman of evangelical opinions. It was she who built Knockbreda Church and also the Bethesda Church in Dublin. It was in his day the parishioners on the County Down side of the river began to revolt against payment of the Church cess. In 1735 it was decided to go to Law to compel them to pay. Who died on 15th January, 1741. His remains are deposited in a Vault which His Parishioners caused to be made under The Chancel from Respect to the Memory of So excellent a Pastor. Also to the Memory of Anne Rogers, Otherwise Redmond, his Wife, who died 25th September, 1751. Also to that of their Children, Conway Rogers, who died 26th November, 1737. William Rogers, who died 21st Sept., 1817. Sacred also to the Memory of Anne Stewart, Otherwise Rogers, the Beloved Wife of Major William Stewart, of his Majesty's 35th Regiment of Foot. She was the eldest daughter of William Rogers, Esq., of Lisburn, and grand-daughter Of the Rev. A. Rogers above named. She Departed this life on the 8th August, 1824, in Giving birth to her fifth child. To those who Knew her no memorial is necessary to Perpetuate the memory of her many and Exalted virtues. Such was the gentleness of her nature, the Humility and benignity of her mind, that it May be truly said: "of such is the Kingdom Of Heaven." Her afflicted husband and a beloved and only sister unite in erecting this monument to her memory. Also to the Memory of William Anthony Rogers Stewart. The only son of Major William Stewart and Anne his Wife, who Died in Dublin on the 10th. September, 1826, Aged 3 years and 7 months. "I will ransom them. from the power of the Grave, I will redeem them from Death. "Hosea 13th chap. I4th verse. The successor to the Rev. Anthony Rogers was a man who does not seem to have been well known-his name was John Walsh, or, more properly, Welsh. This name is not found on the Cathedral Memorial Window, nor is it in Lavens Ewart's Handbook to the Diocese. He was a Lisburn man. His baptism is to he found in the Cathedral Register, 11th May, 1693. He was son of Thomas Welsh, of Lisburn, merchant, who married Dorothy Haddock, of Magheragall, at Lisburn Cathedral, 2nd June, 1692. He entered T.C.D. 12th May, 1711, aged 18: B.A., 1715, and married Mary, daughter of Edward Peers, of Lisburn, by Jane his wife, daughter of Richard Close, of Lisburn, and sister of the Rev. Samuel Close, ancestor of the Closes of Drumbanagher : his marriage settlements were dated 18th April, 1737. The Dean died 1753 (will dated 5 June, 1752, proved prerogative 4 May, 1754), having had five sons and 4 daughters, namely (1) Conway; (2) Thomas; (3) John; (4) Henry; (5) Piers (as he spelled the name). (1) Harriett, married first, at, Lisburn Cathedral, 22nd September, 1760, Ralph Lambert, only son of Montague Lambert, Lieut. 5th Dragoon Guards (by Sarah, daughter of Samuel Waring, of Waringstown, M.P. for Hillsborough), son of Ralph Lambert, Bishop of Dromore, and afterwards of Meath. Mr. Lambert, who was Second Examiner in Chancery, died December, 1761, or January, 1762, and his widow was married again to the Very Rev. Richard Dobbs, M.A., Dean of Connor, son of the Rev. Richard Dobbs, D.D., Rector of Lisburn. She died 25th March, 1784, aged 45, and was buried at Lisburn. Inscription there. (2) Jane (3) Dorothy : (4) Margaret Maria. He was instituted to the Vicarage of Magheramesk and Aghagallon, 8th March, 1730. He was appointed Rector of Aghaderg, 26th March, 1735: he was also Rector of Carrickfergus. He became Dean of Connor in 1743, and resigned the living of Lisburn, but retained these two parishes. He must have been a complete absentee from Lisburn; his name is not found even once amongst those who attended the Vestry meetings. These meetings are signed from 1741 to 1743 by Thomas Johnston, curate; and on 5th October, 1743, by John Arthur, curate; Roger Vere, curate. He died on the 18th April, 1753. I can find no record of his burial, which probably took place in Soldierstown Churchyard. John Welsh, Dean of Connor, Co Antrim. To be buried in the churchyard of the Parish where I die. To my dearly-beloved wife, Mary Welsh (above what she is entitled to by her marr. sett., and also by the Will of Mrs. Elizabeth Close), the sum of £50, her gold watch and chain, and my lease in Lisburn, called Brooke's, which I hold from my good Patron, the Right, Hon. the Earl of Hertford, for her life, and after her death by my eldest surviving son. My other lease in Lisburn, called part Gordon's, and my lease of Broom, and the residue of my real and personal estate and goods to my children equally, viz., to Conway Welsh, Harriett Welsh, Thomas Welsh, Jane Welsh, John Welsh, Henry Welsh, Dorothy Welsh, Margaret Maria Welsh, and Peers Welsh, and if any of said children die under 21 or unmarried the share of such to the survivors of them. To the poor of the parishes of Aghalee, Aghagallon, and Magheramesk, £2 10s. To the poor of the parish of Aghaderg, £2 10s. To the poor of the parish of Carrickfergus, £2 10s. To the poor of the parish of Islandmagee, £2 10s. To the poor of the parishes of Larne and Rallow, £2 10s. To the poor of the Grange of Moylusk, £1 10s. Appoint my beloved wife, Mary Welsh: John Stothard, of Maralin, Esq. ; my brother-in-law, John Peers, and Mr. Edward Jones, Exors. In witness whereof 5 June, 1752. Probate granted 4 May, 1754, to Mary Welsh, the widow, John Stothard, Esq. ; John Peers, and Edward Jones the Exors. The Vestry Records during John Welsh's Incumbency contain nothing but the usual arrangements for the upkeep of the roads, and the Church expenses. It was the custom then to get estimates for a period of seven years for glazing and slating the Cathedral. Ellis Clegg bound himself to keep the windows in good repair for seven years at. £1 2s. 9d. per year. John Hanlon similarly bound himself to keep the slating in good repair for seven years at £2 1Os. per year. THE REV. RICHARD DOBBS (1743-1775). The Very Rev. Dean Welsh was succeeded by they Rev. Richard Dobbs, son of Richard Dobbs, Esq., of Castle Dobbs, Co. Antrim, who was High Sheriff of Co. Antrim 1720, and M.P. for Carrickfergus 1727-1760. His ancestor, John Dobbs, came from England in the latter years of Queen Elizabeth, apparently with the expedition of Sir H. Docwra, under whom he served afterwards as Deputy Treasurer of Ulster; and by marriage with the heiress of Ensign, John Dolwey, of Broadisland, after much litigation, consequent on the appearance of a rival claimant, established the family title to the estate of Castle Dobbs and other estates in County Antrim. Richard Dobbs (jun. ), born in 1694, was in his early days attracted to the life of a sailor, "but after a voyage to the West Indies he formed an aversion to it"-he entered Trinity College as a Fellow Commoner on the 11th June, 17 20 ; graduated B.A. 1723 ; Fellowship, 1724 ; M.A., 17216 ; B.D. and D.D. 1750. He resigned his Fellowship on being appointed Rector of Tullyhog 2nd Oct., 1731. He was appointed Rector of Lisburn and inducted by Thomas Johnston, Vicar of Magheragall, 1st December, 1743. He was married to Mary, daughter of James Young, Esq., of Lisnane, Co. Tyrone. The Dobbs family would seem to have had an early connection with Lisburn--the name Marmaduke Dobbs is found occasionally in Rawdon's letters. Richard Dobbs was also Rector of Clougherny, County Tyrone in 1745. In the same year he resigned Tullyhog, but he remained Rector of Clougherny and Lisburn till his death. An elder brother of Richard was Arthur Dobbs, whose name is mentioned in Primate Boulter's letter. The Primate in a letter to Sir Robert Walpole, 4th January, 1730, recommends him for an audience. He speaks of him as "one of the members of our House of Commons where he on all occasions endeavours to promote his Majesty's service." He is described in a note as "author of the North-West passage to India." Through the Primate's influence he was appointed Engineer in Chief and Surveyor General of Ireland. He is the author of an essay on "The Trade and Imports of Ireland." He had a very distinguished career and became Governor of North Carolina (see Dictionary of National Biography) . Another Brother of Richard was John Dobbs, who was disinherited because of his adherence to the Quakers; he gladly suffered for conscience sake, and afterwards studied medicine, which he practised with great success at Youghal, Co. Cork. His descendants are, I believe, still to be found in Southern Ireland. Richard Dobbs had also some very distinguished sons; one was Francis, born 27th April, 1750. He was the author of some poems published in Dublin 1773 and 1788 ; but he is better known as a politician ; he was a barrister and M.P. for Charlemont. His name is found in the "original Red List" of Sir Jonah Barrington as one who voted against the Union. The note about him in the Red List is: "Famous for his doctrine of the Millennium, an enthusiastic anti-Unionist." He was known as "Millennium Dobbs." His high character but eccentric mind are described by Sir Jonah in "The Rise and Fall of the Irish Nation." The theme of his speeches in the House of Commons was "That Ireland was decreed by Heaven to remain for ever an independent State, and was destined to the super-natural honour of receiving the anti-Christ." (See "Dictionary of National Biography.") He died 11th April, 1811. On which Great Britain has long rode triumphant. Derive honour to themselves They can add nothing to his fame. Of his wounds on board the Drake the 26th of April. 1778. There is a ballad describing the fight, and William Dobbs' part in it, preserved in the Dublin University Magazine, 1836. Another son of the Rev. Richard Dobbs was Richard, who acted as curate assistant to his father at Lisburn, 1764 to 1769; he became Rector of Carrickfergus and Dean of Connor in 1775. He had also a son, John, in Holy Orders, who must have been ordained before the canonical age, as he died before he was 23 years; and yet is described on the grave stone as "an ornament to his holy profession". His brother, Francis, wrote an elegy on his death. The Rev. Richard Dobbs was a friend of Dean Swift, who must have been well acquainted with the Castle Dobbs family during his residence at Kilroot; his name is found in a letter from Swift to the Rev. Mr. Worrall, dated from Twickenham, 15th July, 1726. He seems to have written to Swift to help him in some matter connected with Trinity College, but Swift was too busy and his mind too much occupied with the thought of Stella's illness, which Worrall had told him of, and could not do anything. "Pray tell Mr. Dobbs of the College that I received his letter, but cannot possibly answer it, which I certainly would if I had materials." The prerogative will of the Rev. Richard Dobbs is dated 17th May, 1775 (with codicil 18th May-10 days before his death). It mentions the names of Richard, William, and Francis, and a daughter, Maria, who married Samuel De la Cherois Crommelin. He left £30 to the poor householders of Lisburn. Here lie the remains of the Rev. Richard Dobbs, D.D., 32 years Rector of the Parish Of Lisburn and formerly Fellow of T.C.D. He Was a man of extensive learning, great Piety, and strict honesty. He lived respected And esteemed and died lamented, in charity With all men; on the 28th, of May, 1775, in the 80th Year of his age. Here also lie the remains of the Rev. John Dobbs, the 4th son of the above-named Richard Dobbs, who, during the short period of his Ministry displayed such talents and such Attention to the Pastoral Office that it may lie truly said he was an ornament to his Holy Profession. He died on the 28th of October, 1773, in the 23rd year of his age. Here rests the remains of Mrs. Hariet Dobbs (Wife of the Rev. Richard Dobbs, Dean of Connor), In whom the affectionate wife the tender Mother and the pious Christian were Eminently united. She died the 25th of March, 1784, In the 45th. year of her age. Here lieth the remains of Mary, wife of the Late Rev. Richard Dobbs, D.D., who departed This life April, 1796, aged 82 years. Here lieth the remains of Maria Dobbs, wife of Samuel De la Cherois Crommelin, Esqr., who Departed this life December 12th, 1815, Aged 57 years. The Vestry Records during the long period of the Rev. Richard Dobbs' Incumbency contain evidence that he was most faithful in discharge of his duties. The poor were paid their allowances; the Cathedral was kept in repair ; the Surveyors of roads were regularly appointed. An attempt, not quite successful, was made to light the town. In the accounts of the roads there are some names that might be interesting :-- "The Big Bridge ;" "The Sluice Bridge;" "From the Lane Ends to Buntin's River:-" "The Watch House to Clogher Hill ;" "Antrim Lane to, Cutthill." There are numerous entries about allotting seats in Church. It even appears here and elsewhere in the Vestry Book that the seat-holders sometimes built their own seats. In May, 1750, it is recorded "that the Rev. Dr. Matthews have liberty to build a new seat in that part of the Church now vacant in the south side of the Church opposite the Church door." In the minutes of 33rd April, 1752, there is a registry of several articles belonging to the Church-"Two Silver Chalices, two patens of silver, two flagons of pewter, five pewter plates, two new ladders, one old one, one table cloth and two napkins, four long poles, an oak chest, four oak chairs, a large fir table, and an oak form, two surplices." The present magnificent silver vessels were presented in 1752, but it must have been subsequent to the entry as all are not included in this inventory. They were given by "The Rt. Hon. Francis Seymour Conway, Earl of Hertford," and are probably the best to be found in any church in Ireland. This Lord Hertford was Lord Lieutenant of Ireland. His portrait will be found in the Vestry. There is an interesting note about the Rev. Richard Dobbs in John Wesley's Journal, Vol. II., page 347 (Everyman's. Library). When Wesley visited Lisburn on 23rd July, 1756, he records---The Rector, with his Curate, called upon me, candidly proposed their objections, and spent about two hours in free, serious, friendly conversation. How much evil might be prevented or removed would other clergymen follow their example!" The Curate referred to was the Rev. John Arthur, who was either then or afterwards Vicar of Aghalee. Many other parochial events worth recording, if we knew them, must have occurred during Mr. Dobbs' tune, but the Vestry Book confines its records to its own transactions. I have read articles in old newspapers written, I believe, by the late Mr. Hugh M'Call, giving an account of presentation of a bell and other gifts by the Hertford family. But this information must have been taken from "Heterogenea," by J. Moore Johnston. THE REV. THOMAS HIGGINSON (1775-1781). The Rev. Richard Dobbs was succeeded by the Rev. Thomas Higginson, who was born in County Wexford, son of Thomas Higginson, in 1722. He entered T.C.D. 27th January, 1739, aged 17, and got Scholarship in 1743. He became Rector of Lisburn in 1775 ; he was also Vicar of Ballinderry. (1) Thomas Edward, born 1767. He was also in Holy Orders, and was Rector of Lambeg. He died 22nd June, 1819. He is buried in the graveyard of the Middle Church, Ballinderry, where there is a gravestone with this inscription. To the Memory of the late Rev. Thomas Edward Higginson, A.B., formerly Curate of this Parish, and last Government Chaplain of the French Huguenots at Lisburn. He Died 22nd June, 1819, aged 52. (2) Eliza-married Henry Marmion, of Lambeg; and secondly, Roger Casement, of Ballee. (3) Maria-married John Johnston, of Dublin. The house in which the Rev. Thomas Higginson resided at Ballinderry is marked "Woodbrook" in Taylor and Skinner's Road Map of Ireland. The Rev. Thomas Higginson must have resigned the living of Lisburn long before he died, as his successor was appointed in 1781. His Wife Anne, who departed This life 21st Nov., 1798, Aged 76 years. To his Memory by his Grandson. Henry Higginson, A.M., J.P., Lisburn May 1855. The Rev. Thomas Higginson also finds a place in John Wesley's Journal, Vol. iii., page 364 (Everyman's Library). He came to Lisburn from Carrickfergus and was "agreeably surprised by a visit from Mr. Higginson, Rector of Ballinderry." This was Saturday, 8th April, 1769. The only part of the conversation Wesley writes in his journal is a. story told him by the Rector rather discreditable to the Moravians. Let us practise the charity that imputeth no evil and believe that the good man did not write clown that, story because he previously had a very serious quarrel with that body. I believe Dr. Higginson's father, or brother, had been agent to the Hertford Estate ; but I have not definite information. The only interesting items in the Vestry Book for this period refer to the lighting of the town, which was then the work of the Cathedral Vestry; also the repair of the "Cupola"--this, of course, before the present graceful spire was built-at a cost of £18. The Churchwardens had not at that time control of the sittings in Church, for the seat No. 12 on the north side, below the pulpit, one-third of which belonged to Mary Keenan, was sold to Wm. Coulson for three guineas-one to be paid to the Churchwardens, and two to Mary Keenan. But there is a further note that she withheld her consent, and Wm. Coulson had to look for a seat elsewhere. THE REV. WILLIAM TRAILL (1781-1796). Dr. Higginson was succeeded by the Rev. William Trail, grandson of the Rev. William Traill, Minister of Benholme, in Kincardineshire, and Isabella, daughter of John Haldane, Esq., of Myrstown, near Stirling, and son of the Rev. William Traill and his cousin, Mary Traill, twin sister to James Traill, Bishop of Down. This William Traill was minister of the United Parishes of Logie and Pert, near Montrose, and in 1751 was translated to St. Monance in Fyfe. William Traill, Rector of Lisburn, was born 23rd June, 1746. He was educated at Aberdeen, and got M.A., Glasgow. In August, 1766 he was appointed Professor of Mathematics in Marischal College, Aberdeen (of which he became LL.D., 1774), after a public examination of several days before Professors of other Universities in Scotland. This was a great achievement for a young man just over 20 years of age. He was ordained Deacon May 8th, 1774, and Priest May 15th, 1774-.a week's interval. He was collated to the Prebend of Cairncastle 21st May, 1774, by his Uncle, the Bishop of Down and Connor ; this prebend he resigned in 1781 for the Chancellorship of Connor, and Incumbency of Lisburn, to which he was presented by the Marquis of Hertford. On account of his health he resigned the Incumbency in 1796 ; but he retained the Chancellorship till his death, at Bath, on 3rd, February, 1831. His wife was Lady Frances Charteris, second daughter of the Earl of Wemys. They had no children. She died 1st April, 1848. In 1812 he published an account of the life and writings of Robert Simpson, M.D., Professor of Mathematics in the University of Glasgow. It is somewhat sad to think that this great scholar's energies in Lisburn were chiefly devoted to the paving of the streets. The Vestry Minutes are a record year after year of contracts about stones and paviours. But he did something else. It is to him the Parish owes the present fine Rectory. On 27th August, 1781, he presented a memorial to build a new glebe. For this purpose the Marquis of Hertford granted a site to him "and his successors' rectors for ever." The actual building did not begin till 28th May, 1784. Dr. Traill raised a sum of £600 for the purpose, and the house was built. His successor, Dr. Cupples, had to pay to Dr. Traill £553 16s 11d, and Dean Stannus paid to the representaties of Dr. Cripples £415 7s 3d, being three-fourths of the original charge : and the Irish Church Temporalities Commissioners paid the representatives of Dean Stannus £249 13s 6d: after Disestablishment the Representative Church Body paid £260 15s 10d for the house to the Commissioners, and £392 was allotted to Lisburn out of the £500,000 given by Mr. Gladstone in lieu of private endowments. From this the Representative Body repaid the £260 15s 10d, and did some repairs to the house. I believe there is still a small sum of the purchase money due to them. This is the story of the Rectory, as I find it in a letter written by Dr. Hodson to the "Belfast - News-Letter" 3rd July, 1876. It is a fair example of how the Church of Ireland and its property were dealt with by the Liberal Government in 1869. 1.) The Rev. Edward Cupples, born County Antrim, baptized at Carrickfergus, 2nd August, 1785 ; educated by his father; entered Trinity College, Dublin, 4th January, 1802, aged 17 years. B.A. 1806, LL.B. 1809. 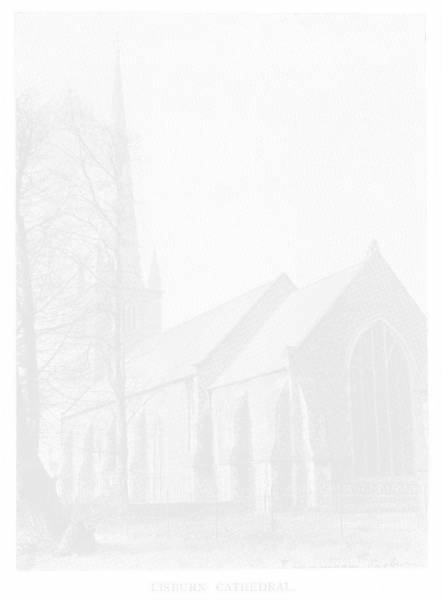 Ordained Deacon at Lisburn 13th December, 1807; Priest at Down 22nd October, 1809 ; Vicar of Glenavy, Connor, 27th February, 1813. He was also Vicar-General of Down and Connor. (3.) William Cupples; died unmarried. (4.) Charles Cupples; baptized at Carrickfergus 18th July, 1791; M.D., Royal Artillery. (5.) Ezekiel Daveys Wilson Cupples; baptized Carrickfergus, 9th March, 1795 ; died unmarried. (6.) Maria; married the Rev. John Corken of Ingram. And Maria, who died in infancy, buried at Carrickfergus 24th March, 1796, aged 8 years, and Elinor. The Rev. Snowden Cupples was buried at Lisburn on 25th October, 1835. He was a faithful and diligent Rector, who attended the Vestry meetings and looked after the interests of the Cathedral. He was Rector during the stormy period of the Rebellion of 1798. It must have been a painful experience for him when his parishioner, Henry Munro, was induced to join the rebels; and was executed in the Market Place in his presence. The story has often been told of how Dr. Cupples, though himself a staunch loyalist, befriended Munro after his arrest, and gave him Holy Communion at the Rectory on his way to the scaffold. He wrote a most interesting paper, "An Account of the Town of Lisburn," read before " The Literary Society of Belfast," 3rd May, 1813. The present beautiful spire was built in 1804, the contractor being David M'Blain, of Newtown Limavady. The cost was £1,300. The names of the Committee who signed the contract with David M'Blain were: Rev. Dr . Snowdon Cupples, the Rev. Hill Coulson, William Smith, Roger Johnson Smyth, Joseph Fulton, Samuel Delacherois, Poyntz Stewart, Cornelius Carlton, John Crossley, Robert Bell, Thomas Beatty, and Archibald Mussen. "At a Court of Vestry, held in the Vestry Room of the Parish Church of Lisburn, on Monday, the 29th day of May, 1826, at the hour of twelve o'clock, for the purpose of selling ten new seats in the first gallery of the Parish Church of Lisburn, pursuant to notice given by public advertizment. Terms of Sale-Ready money or three months' credit on approved security to the Churchwardens. Auction duty to be paid by the purchaser. The seats are sold under the express condition that they cannot be sold or transferred to any person or persons except to a resident parishioner or parishioners. North Gallery, No. 1, being the second seat in the Gallery, purchased by me for seventeen pounds British. North Gallery, No. 2, being the third seat in the Gallery, purchased by me for nineteen pounds British. Do. No. 3, being the fourth seat in the North Gallery, purchased by me for seventeen pounds ten shillings British. Do. No. 4, being the fifth seat in the North Gallery, purchased by me for ten pounds British. North Gallery continued; No. 5 being the sixth seat in the said Gallery, purchased by we for eight pounds ten shillings British. The five seats in the South Gallery were similarly purchased by Robt. McCall; James Smyth; William Dillon and Thomas Wetherd; Bernd. Roony and H. B. Whiteford." It is interesting to note that the great wars which were going on. through Europe, including the Napoleonic wars, and the great Victories of Wellington and Nelson, scarcely find an echo in the Vestry records; not even the Rebellion of 1798 in Ireland, which must have caused serious anxiety in Lisburn. Here and there just a note of men being drawn by ballot for the Army of Reserve. The Church work went on without interruption. THE VERY REV. JAMES STANNUS, DEAN OF ROSS (1835-1876). Dr. Cupples was succeeded by the Rev. James Stannus, son of Thomas Stannus, M.P. for Portarlington, who served during the American War, and was severely wounded. He graduated in T.C.D. as A.B., 1809; M.A., 1827; from 1820 to 1836 he was Rector of Ballinderry; and from 1835 to 1876 he was Rector of Lisburn. To both these livings he was presented by the Marquis of Hertford, to whom he was also agent. From 1830 to his death, he was Dean of Ross, County Cork. There were no duties attached to this deanery, nor was there any house for the residence of the Dean. The net amount of the Dean's revenue from this source was only £86 4s 3d per annum. He married on 22nd April, 1816, Elizabeth, daughter of Sir Erasmus Dixon Borrowes, Bart., of Lauragh, Portarlington, and had four sons:- (I) Thomas Robert : (2) Beauchamp Walter; (3) Henry James: and (4) Walter Trevor : also three daughters-(l) Harriette Jane: (2) Caroline Mary Anne; and (3) Elizabeth Emily Sophia. Dean Stannus died in Lisburn on 28th January. 1876, and is buried in the Cathedral graveyard. The Disestablishment of the Church of Ireland took place while he was Rector. He never attended the Vestry meetings of the Disestablished Church, but, of course, he was then an old man. He did not commute nor compound, and so no composition balance came to the parish through him. It was during his Incumbency Christ Church was built as a Chapel of Ease in 1843, and remained so till a deed of endowment, dated 15th September, 1863; assigned a Pastoral District to the Church, and the Rev. W. D. Pounden was appointed perpetual Curate. The Endowment being the tithe rent charge of Aghatrisk £18 9s 4d, and Magherageary £21 16s Id. Since that time Christ Church has been enlarged, and has had a succession of faithful Rectors and Curates, to whom, under God, it owes its present prosperous condition. THE CLERGY OF CHRIST CHURCH. Curates-Rev. J. Nash Griffin, 1842; Rev. J. Hudson, 1845 ; Rev. Hartley Hodson, 1846. Perpetual Curate and Rector-Rev. W. D. Pounden, 1863. Rectors--Rev. G. Chamberlain, 1884; Rev. A. Moore, 1886; Rev. J. I. Peacocke, 1894; Rev. R. U. Greer, 1902; Rev. R. H. S. Cooper, 1911. The present Church of St. Matthew, Broomhedge, was also founded as a Chapel of Ease in 1839. By a deed of Endowment, dated 8th August, 1865, a Pastoral district was assigned from the Parish of Blaris to this Church. The Rev. Maurice Knox McKay was appointed perpetual Curate. The Endowment being the tithe rent charge of Blaris £18 8s. 5½d, Lurganure £22 2s, 4½d. The present Church was opened on 24th July, 1842, and the preacher was the Rev. Wm. Reeves, afterwards Bishop of the Diocese. The Church was not consecrated till 26th September, 1848, when Dr. Mant was the Bishop. The preacher on that occasion was the Archdeacon of Down. This Church has also had a succession of Godly and faithful ministers, whose labours have not been in vain. The present Rector, the Rev. John Leslie, M.A., was inducted on 21st November, 1880. The preacher on that occasion was Canon Hodson, and it is pleasant to record that now at the end of 46 years' service Mr. Leslie's zeal for God's work has not abated, and the enthusiasm of his youth remains with him. He was ordained Deacon in Holywood Parish Church on 11th June, 1876, by Bishop Knox, and Priest in Down Cathedral, 27th May, 1877, by the same Bishop. This year he celebrated his ministerial jubilee. THE CLERGY OF ST. MATTHEW'S. Curates officiating from 1842 to 1849-Rev. E. L. Fitzgerald, Rev. John Woodroffe, Rev. J. Nash Griffin, Rev. W. K. Tyner. Curates in Charge-Rev. Wm. M'Jennett, 1849: Rev. J. H. Seymour, 1854; Rev. M. K. McKay, 1856 (became Perpetual Curate 1865). Rector, Rev. John Leslie, 1880. If St. Matthew's and Christ Church are daughters of the old Parish of Blaris, Eglantine must be considered a flourishing grand-daughter. In 1874 the parochial district of All Saints', Eglantine, was formed, and a Church built by the Mulholland family. The foundation stone was laid 27th June, 1874, and the Church consecrated by Bishop Knox 15th July, 1875. The pastoral district was formed from St. Matthew's and Christ Church. Rev-. S. Campbell, 1873: Rev. F. W. Hogan, 1883;. Rev. J. S. Taylor, 1915; Rev. A. D. Mitchell, 1917. The old Parish of Blaris consisted of 26 townlands as follows:-Lisnagarvey, Old Warren, Tonagh, Knockmore; Ballymullan, Largymore, Broughmore, Gortnacor, Lurganure, Ternaghfeeva or Lissue, Ballintine, Deneight, Lisnatrunk, Taghnabrick, Annacloy, Aghnatrisk, Ballykeelednagonnell, Culcavy, Carnbane, Carnreagh, Druinatihugh, Maze, Magherageary, Ravarnet, Lisnoe, Blaris. The pastoral district of Christ Church consists of: Old Warren, Ballykeelednagonnell, part of Culcavy, Carnbane, Carnreagh, part of Maze, Ravarnet, Blaris and Magherageary. The pastoral district of St. Matthew's, Broomhedge, consists of :- Broughmore, Gortnacor, Lurganure, Ternaghfeeva or Lissue, Annacloy, Aghnatrisk, part of Culcavy, and part of Maze. THE REV. HARTLEY HODSON, D.D. (1876-1884). The successor to Dean Stannus was the Rev. Hartley Hodson. He was a lineal descendant of Dr. John Hodson, who assisted Charles I. in his escape from Oxford in 1641, and at the Restoration was made Bishop of Elphin. The Rev. Hartley Hodson was son of William Hartley Hodson, of Old Connaught, Bray, and Eliza, daughter of Henry Duell, of Ballinrobe. He was ordained Deacon in St. Anne's, Belfast, by Bishop Knox, on the 6th June, 1841, and Priest in the same Church by the same Bishop on 22nd May, 1842. He was Curate of Derriaghy-having sole charge of Stoneyford-from 1841 to 1846 ; from 1846 to 1862 he was Curate of Lisburn, having sole charge of Christ Church, and from 1862 to 1876 he was Rector of Derrykeighan, and Prebendary of Carncastle (1863), and from 1876 till his death in 1884 he was Reactor of Lisburn. On the 2nd May, 1850, he married Hannah, eldest daughter of William Gregory, M.D., of Bell View, Co. Dublin, and had issue: William Gregory, Hartley Richard, John Robert, Mary and Hannah. He was a graduate and Doctor of Divinity of Trinity College, Dublin. He is still affectionately remembered as a faithful and diligent Pastor. It was largely owing to his efforts that the Parish to-day possesses one of the best Parochial Halls in the Diocese : though he did not live to see the work completed. He also did much Diocesan work, and was for many years secretary to "The Additional Curates' Fund Society." He gave much help in the building of fourteen Churches in the Diocese. REV. WILLIAM D. POUNDEN, B.A. (1884-1917). Dr. Hodson was succeeded by Canon Pounden, son of the Rev. Patrick Pounden, Rector of Westport, and Elizabeth, daughter of the Rev. W. Dawson, Rector of Clontibret. He graduated in Trinity College, Dublin, in 1854; ordained Deacon in 1855 for the Curacy of Waringstown; and Priest the following year; in 1861 he was appointed Curate of Bangor, and in 1863 Perpetual Curate of Christ Church, Lisburn, to which, in the same year, was assigned a Parochial district. On the death of Canon Hudson, in 1884, he became Rector of Lisburn Cathedral and Prebendary of Cairncastle; and in 1893 he resigned this Prebend and became Treasurer. He died on the 29th September, 1917. Canon Pounden was a man greatly loved and respected in the town of Lisburn, and in the whole United Diocese. He lived to a great age; he had spent 54 years in Lisburn. During his incumbency the present beautiful Chancel was added to the Cathedral ; the stained-glass Windows in Memory of Sir Richard Wallace and the Bishops and Rectors were dedicated. The buttresses to support the walls were built, and the Parochial Hall --provision for which had largely been made by Dr. Hudson--was completed. THE REV. WILLIAM P. CARMODY, M.A. (1917-1923). Canon Pounden was succeeded by the Rev. William Patrick Carmody, son of Patrick Carmody, of Comeragh, Co. Waterford, and Catherine, daughter of John Cox, of Kilnagalla, Kilrush, Co. Clare. He entered Trinity College in 1882: graduated B.A. in 1886; was Sizar and 1st. Honorman in Mathematics, also Catechetical Prizeman; M.A. 1918; ordained Deacon in Holywood Parish Church for the Curacy of Layde, October, 1892 ; Priest in Lisburn Cathedral, June, 1895; Rector of Connor, 1898 to 1904 : Rector of Carrowdore, 1904-1908; Rector of Knockbreda, 1908-19117: Member of Diocesan Council, 1912; Rural Dean of Hillsborough, 1913-1924; Member of General Synod, 1915; Member of Diocesan Board of Education, 1918; Member of Representative Body, 1925; Rector of Lisburn Cathedral, 1917-1923 ; Prebendary of St. Andrew, 1916; Treasurer and Canon of Connor, 1917; Examining Chaplain to the Bishop of Down. 1919; Prebendary of Wicklow and Canon of St. Patrick's, Dublin, 1920: Commissary to the Bishop of Bendigo, 1920; Diocesan Nominator for Connor, 1917 ; Member of Diocesan Court, 1923: Dean of Down and Rector of Down, 1923; Diocesan Nominator of Down, 1925 : Select Preacher before the University of Dublin, 1926; Member of Ecclesiastical Records' Committee, 1925: Author of "Cushendall and its Neighbourhood," "Lisburn Cathedral and Its, Past Rectors," "Antiquities of Northern Ireland;" Special Edition of "The Times," 5th December, 1922. Married 4th October, 1899, Ethelwyn, daughter of the Rev. Wm. Thompson, Rector of Cushendall; and has issue: Wm. Raymond; Catherine Sarah; Ethelwyn Caroline, and Dermot Mahon. During his incumbency Lisburn Cathedral was renovated; the whole of the Nave and Chancel retiled, and other improvements made as a memorial to the men who fought and died in the Great War; the Tercentenary Services were held; and the nucleus of a Cathedral Library was formed. I have not included the minister in charge during the commonwealth period, for it would seem from Rawdon's letters to Conway that James Hamilton still was rector during that period, though not resident and not in receipt of salary. He was an Anabaptist who had suffered imprisonment for his opinions in England, but was appointed to preach in St. Michan's, Dublin, in August, 1651; this lasted three months, for which time he received £25 for his services, and was then transferred to Lisnagarvey at an annual salary of £120. The Commissioners recommended him cautiously as "a man of meek spirit, so far as we can discern." Patrick Adair, who knew him better, described him as "void of human learning, never educated that way, but a tradesman, and imprudent." However, he was at first warmly welcomed in Lisburn. Sir George Rawdon was in raptures; in a letter to Conway he calls him "a rare treat, a most powerful preacher, so that the Congregation at Lisnagarvey is very great and look upon it as a very great mercy and Providence.'' It is hard for a popular preacher to please everyone; so we find Lady Rawdon, soon after, writing to her brother, Lord Conway: "There is nothing I dislike here but Mr. Wykes, whom I never can like. You would very much oblige me if you would send a good minister here, as it is hard to live by such a one as he." He was, however, very popular with the Commissioners, who provided him with a house and "as much land as would pasture a dozen cows and grow as much corn as would provide for himself and his family." This was quite exceptional treatment, but it did not succeed in making him a farmer. We find him before six months engaged in bitter controversy with the Presbyterians and getting the worst of the encounter. This may have been the reason why in 1658 Sir George Rawdon deprived him of his land and withheld the tithes, requesting that these might be appropriated for the purpose of founding a free school at Lisburn. Wyke protested, and appealed to the Lord Chief Baron without success; he was then transferred to the parishes of Donaghcloney and Tullylish at £100 a year. When preaching at Lisburn he had also to minister to Dromore, Lurgan and Kilwarlin, and while at Donaghcloney he had to preach at Magheralin. We finally hear of him in jail at Carrickfergus for supposed complicity in an attempt by Thomas Blood to restore the "privileges" of the Commonwealth after the Restoration. See "A True Narrative," by Patrick Adair, and "The Puritans in Ireland," by St. John D. Seymour.